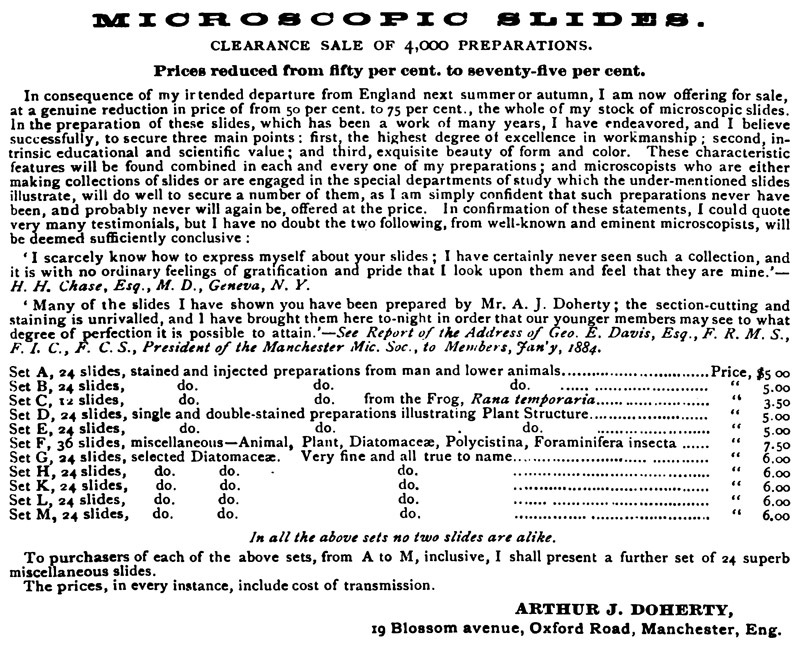 A professional microscope slide maker, Arthur J. Doherty opened the College Microscopical Depot in Manchester, England in approximately 1884. The shop was adjacent to Victoria University (now the University of Manchester), where he likely did good business with the students. Doherty began making slides while in his teens, opening the business while in his early twenties. He continued slide making and selling until about 1900. Doherty mounted a wide variety of specimens, animal, vegetable and mineral. His slides are generally of very high quality, both in specimen preparation and finish (Figure 1). Doherty also wrote authoritatively on aspects of specimen preparation and slide making, including injecting animals and tissues with dyes. His widely-cited protocol for double-staining plant tissues is reproduced at the end of this essay. Figure 1. 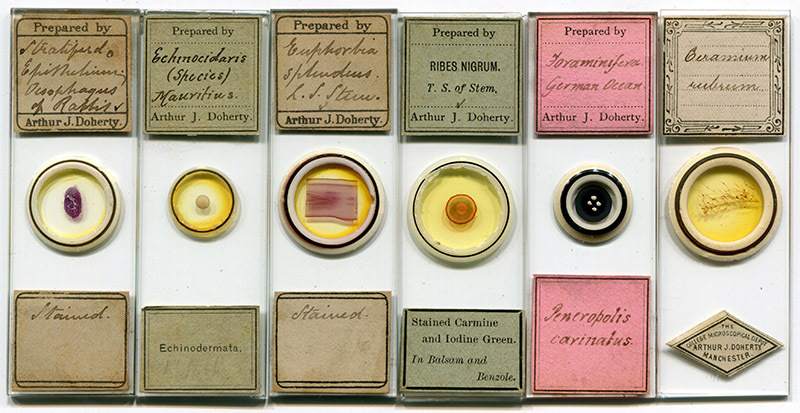 Representative microscope slides produced by Arthur J. Doherty. He mounted a wide range of materials. Illustrated specimens include human histology, a sectioned sea urchin spine, plant sections and polycistina. Arthur John Doherty was born during July, 1860, in Chorlton on Medlock (now part of Manchester), Lancashire, England. He was the second child, and eldest son, of Joseph and Mary Doherty. Arthur did not marry until late in life, and appears to have lived with his parents for much of their lives. The 1895 Slater's Manchester and Salford Directory recorded that father Joseph operated a tailoring business from the same location as Arthur’s microscopy shop. The Doherty family lived at 26 Leamington Street from at least 1871 until the early 1880s. The 1881 census reported that Arthur worked as a “shorthand writer”. The earliest identified records of A.J. Doherty’s microscopical interests date from 1881 (Figure 2). 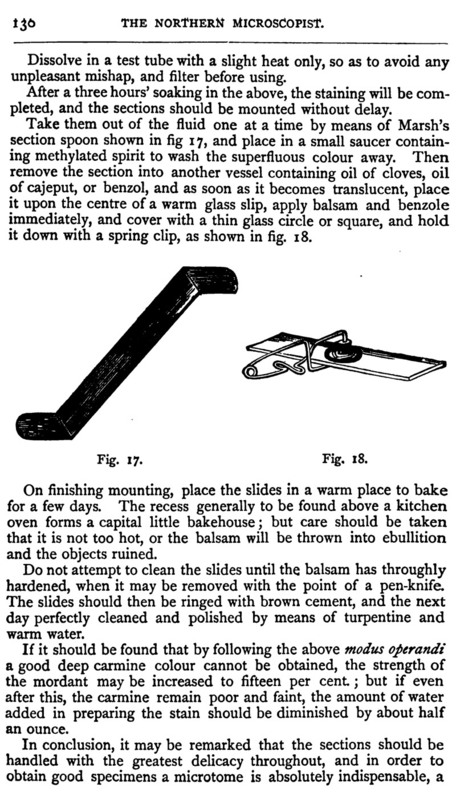 However, a note he published that March in The Northern Microscopist, on making ringing varnish for slides, stated that he had been using his recipe “for about fifteen months” (Figure 2B). Thus, Doherty was experimenting with microscopy since 1879, possibly earlier. By 1881, Doherty was actively involved with the Manchester Microscopical Society, displaying “sections of wood double stained” to the Society on March 12 of that year. Quite likely, the combination of Doherty’s enthusiasm for microscopy and the Society’s encouragement led to his early development of expertise in the field. 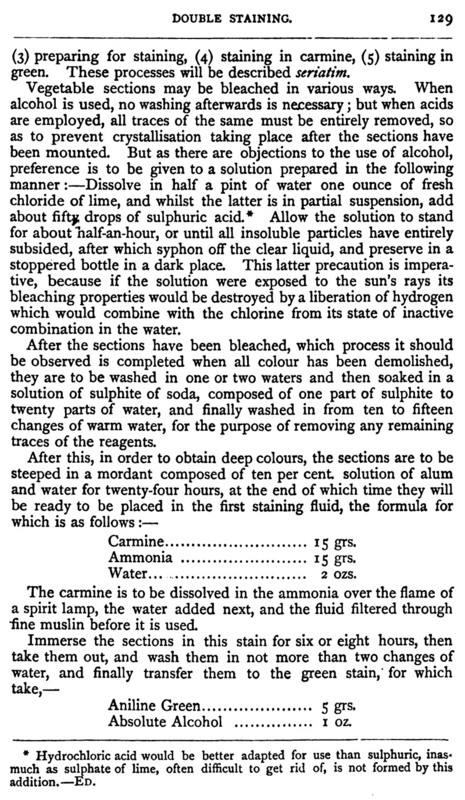 Arthur Doherty’s skills had reached a state where he could write an authoritative protocol for double-staining botanical materials by 1881, and which was cited as state-of-the-art for several years thereafter. 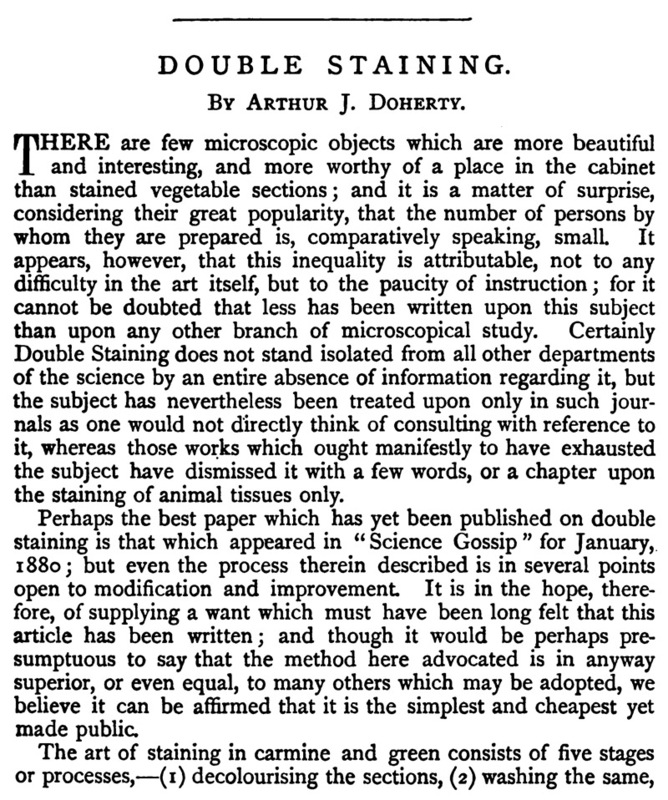 A reproduction of Doherty’s “Double Staining” can be read at the end of this essay, as Figure 13. The 1881 records indicate that, while Doherty had developed skills in staining specimens and making varnish from scratch, he was only just getting serious about microscopy. In February of that year, he asked for advice on cleaning diatoms (Figure 2A). Later that year, he sought a microscope and other equipment. As a working-class shorthand writer and son of a tailor, it is not surprising that Doherty offered microscope slides in exchange for equipment, rather than money. In May he requested a ringing table (Figure 2D). He offered “carefully finished slides of diatoms” in exchange, suggesting that he already had access to a ringing table, probably through the Microscopical Society. That also suggests he was successful in his quest for information on cleaning diatoms. In September, Doherty requested a lamp for his microscope, which would allow him to study and work after sunset (Figure 2E). 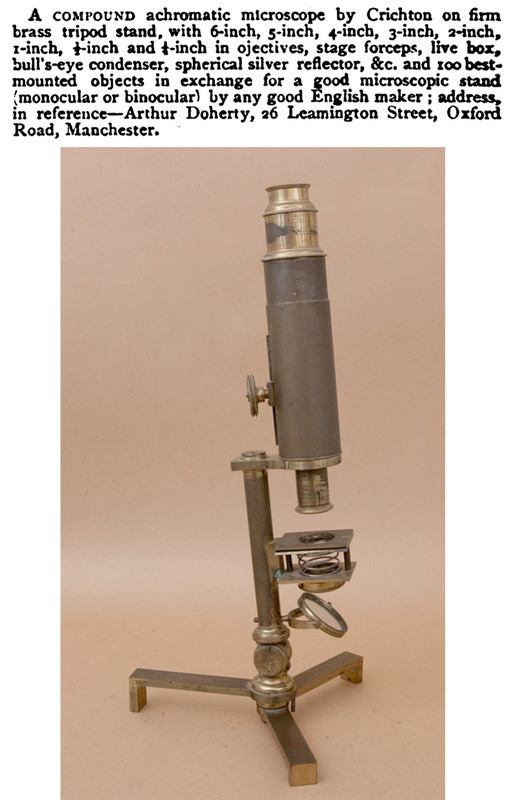 Doherty also asked that year for a modern microscope, offering up his olden-style microscope in exchange (Figure 3). Figure 2. 1881 magazine postings from Arthur Doherty, requesting microscopy equipment and information, and also offering specimens and information. The requests for a ringing table and a microscope lamp suggest that Doherty was beginning to get serious about microscopy at that time. (A and B) from ‘The Northern Microscopist’. 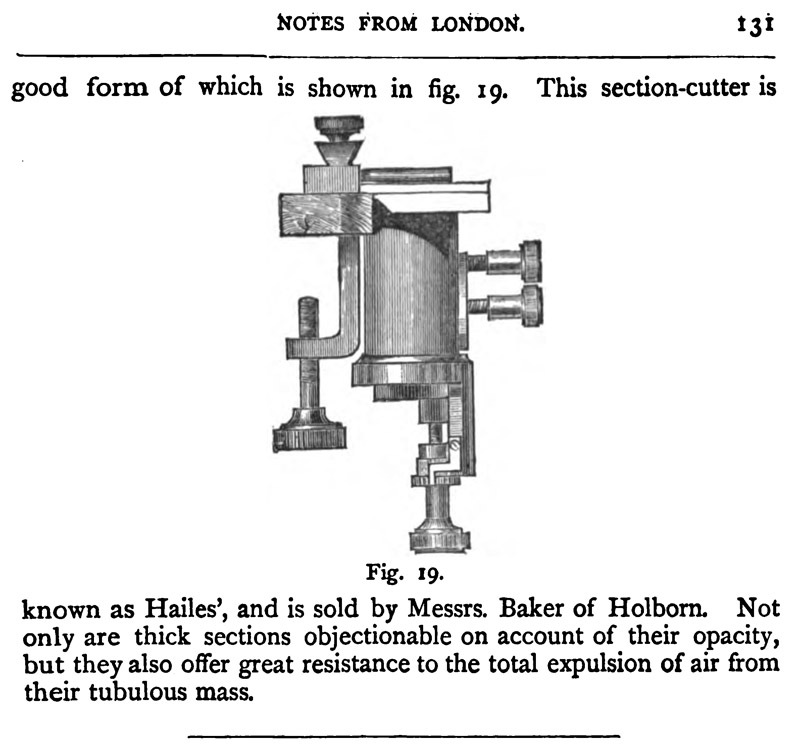 (C, D and E) from ‘Hardwicke’s Science-Gossip’. In October, 1882, and March, 1883, Doherty published requests for Popular History of British Lichens, by W. Lauder Lindsay. In the January issue of Hardwicke’s Science-Gossip, he requested “Wanted, lichens, mounted or unmounted; also a first-class section-cutter; liberal exchange in slides or material”. The January, 1884, issue of The Journal of Microscopy and Natural Science carried Doherty’s article on the lichen Solorina saccata. Arthur drew the accompanying figure (shown here as Figure 4). Figure 4. Drawing of the lichen Solorina saccata, by Arthur J. Doherty. From The Journal of Microscopy and Natural Science, 1884. December, 1882, also found Doherty advertising from 21 Barton Street, in the Moss Side area of Manchester. He stayed at that location only briefly. Within a month, he moved up the street to number 25. A January, 1883, exchange ad in Hardwicke’s Science-Gossip gave the address of “25 Boston Street’, an obvious typographical error. The May issue of that magazine printed the correct address of 25 Barton, as did also the January issue of The Microscopical News and Northern Microscopist. By January, 1884, the Dohertys had moved to 33 Burlington Street, where Arthur opened his College Microscopical Depot. This was close to Oxford Road, and adjacent to Victoria University. At approximately the same time, microscopist Edward Ward moved from 29 Burlington Street to 249 Oxford Road. Ward also sold slides and supplies to the University students. Both Ward and Doherty were members of the Manchester Microscopical Society, and would have been very familiar with each other. It is possible that the two men cooperated to some degree with their shops and wares. It is also possible that Doherty jumped into the opening left by Ward when he moved from Burlington to Oxford. Noting that Ward’s business succeeded into the 1920s, while Doherty made plans to quit the business by the end of the 1890s, it looks like Ward made out the better. Figure 5. 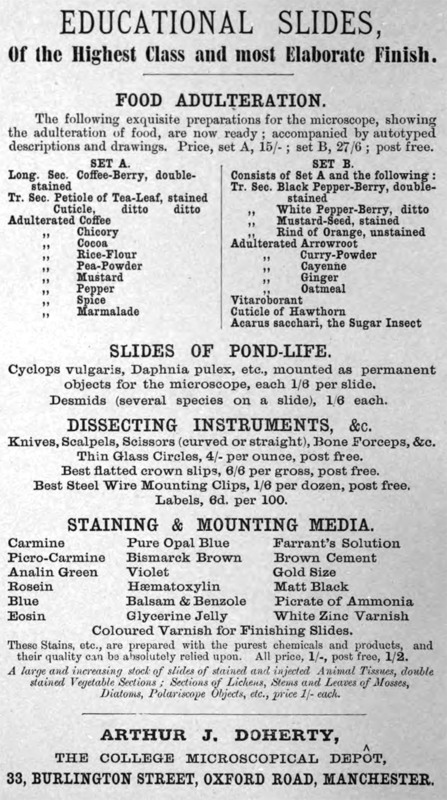 Advertisement from the inside cover of the January, 1884 issue of ‘The Journal of Microscopy and Natural Science’. Early in 1884, Doherty entered into a partnership with J. Ernest Ady, to provide a series of 24 microscopical specimens, plus lithographs and details on preparation (Figure 6). Hardwicke’s Science-Gossip announced in April that “Mr. Ady's ‘Popular Studies in Comparative Histology,’ in which he is assisted by Mr. A.J. Doherty, of the Victoria University, Manchester, commenced on March 10th”. The Illustrated Science Monthly reported, “ ‘Popular Studies in Comparative Histology’ is to be the title of a new series of essays, accompanied by lithographed illustrations and mounted preparations for the microscope. The series is under the editorship of Mr. J. Ernest Ady, favourably known by his studies in petrography, assisted by Mr. A.J. Doherty, of Victoria University, and will be commenced, we understand, on the 10th of March. The issues are proposed to be fortnightly”. This project did not last long. The July, 1884, issue of Hardwicke’s Science-Gossip included this note, “Mr. A.J. Doherty requests us to inform our readers that he has withdrawn from his connection with Mr. J.E. Ady, and that none of the slides accompanying the ‘Popular Studies in Comparative Histology,’ with the exception of the sections of Physcia stellaris and Rosa canina, will be prepared by him”. At about the same time, Ady had a short-lived partnership with mineralogist Heinrich Hensoldt, which also promised to supply a series of microscope slides. The address given in the advertisement shown in Figure 6 was Hensoldt’s home. The Ady - Hensoldt partnership was named ‘The Morphological Laboratory”. Figure 7, below, shows a microscope slide of a Rosa canina section, bearing Morphological Laboratory labels. Since Doherty acknowledged making slides with that specimen for Ady, this is very a Doherty preparation. The handwriting, presumably, is Ady's. Figure 6. Advertisement for Ady and Doherty’s microscope slide series on comparative histology, from ‘Hardwicke’s Science-Gossip’, 1884. Figure 7. A microscope slide of Rosa canina (dog rose), which was very likely produced by A.J. Doherty in 1884 for sale by his partnership with J.E. Ady. The November, 1884, issue of The Microscopical News and Northern Microscopist published a paper “On Injecting” by Arthur J Doherty. Doherty’s reach extended to the U.S.A. by 1886. That year, and for several years afterward, he advertised slides and unmounted specimens in U.S. microscopy magazines. Figure 8. 1886 advertisement from Arthur J. Doherty, from ‘The American Monthly Microscopical Journal’. In 1886, Arthur Doherty announced that he was planning a trip to Australia and the U.S.A. (Figure 9). To raise funds for the trip, Doherty held a massive clearance sale and reduced his prices for slides. His advertisements gave the address of 19 Blossom Ave. That was the home of his elder sister, Fanny, and her family, located around the corner from the Doherty’s former Leamington Street home. This suggests that Doherty closed down the 33 Bloomington Street microscopy shop in preparation of his trip, providing the permanent home of his sister for communications. Figure 9. An 1886 advertisement from ‘The American Monthly Microscopical Journal’. Animal and plant section cutting. Mounting in balsam and other media with and without pressure. The mechanical and optical construction of the lantern microscope, including an exhibit of a number of beautiful objects by means of the instrument. Mr. Doherty leaves England for Australia upon the 23d July, and any communication to him should be addressed to the general post-office, Sydney, New South Wales. If he can make a sufficient number of engagements to pay expenses he will make the trip to the United States across the Pacific. We are glad to commend this project to our readers as one which will be likely to result in substantial benefit to them, provided it can be executed. Of the value of such demonstration there can be no doubt, especially in the case of those who do not have the opportunities for work in the great laboratories. The similar project of demonstrations before the American Society of Microscopists will be very profitable to those who can be present at the meeting. Of the ability of Mr. Doherty to conduct such demonstrations we are fully assured from the character of the work we have seen from his hands. The expense of such a project would not be excessive if distributed among a number of societies”. The June 21, 1887 meeting of the San Francisco (California) Microscopical Society included “A communication .. from A.J. Doherty, of Manchester, England, the well-known preparer of microscopic objects, announcing his intention of visiting this city in a few months. Arrangements have been made with him for a series of demonstrations of the most approved methods used in the preparing and mounting of objects for the microscope, and from the admitted ability of the gentleman in this line his discourses cannot fail to be interesting and instructive. A series of slides mounted by him and comprising a wide range of subjects, were shown under a number of microscopes last evening by J. G. Clark, and the excellence of workmanship shown by these mounts, elicited the warmest commendation”. The Microscope wrote that year that “We have received .. from Mr. Arthur J. Doherty, of the College Microscopical Depot, Manchester, England, a box of sample slides. We can truthfully say that we have never seen better examples of staining and mounting than as here presented . Microscopists who wish to fill empty spaces in their cabinet, will do well to consult Mr. Doherty's catalogue” and “Mr. Arthur J. Doherty, of Manchester, England, to whose work we have already referred, is shortly to pass through the United States on his way to Australia. During his tour Mr. Doherty proposes to give a series of practical demonstrations before microscopical societies. The following list of subjects have been selected for this purpose: Animal and plant-section cutting: Single and double staining; Anatomical injecting; Selecting and arranging Foraminifera; Mounting in balsam and other media and without pressure; The mechanical and optical construction of the lantern microscope, including an exhibition of a number of beautiful objects by means of this instrument. Mr. Doherty's long experience and well-known skill in practical and theoretical microscopy need not here be referred to. We hope that secretaries of Societies will avail themselves of this opportunity and communicate at once with Mr. Doherty, at 19 Blossom Ave., Manchester, England. A small fee will be charged for these demonstrations”. The next month, The Microscope amended this to “Mr. Arthur Doherty’s address is, General Post office, Sydney, New South Wales, instead of Manchester, Eng., as given in our last issue”. Our slide maker was probably the Mr. A.J. Doherty, “labourer”, who arrived in Sydney, Australia, on September 2, 1887, aboard the “Orizaba”. Just what Doherty did in Australia is as-yet unknown. The April, 1888, issue of The American Monthly Microscopical Journal included this editorial, “We announced some time since (Journal, viii, p. 134) that Mr. A.J. Doherty, of Manchester, would shortly visit this country. The plan then projected was interfered with, but Mr. Doherty has lately written again concerning his intentions. From his letter we quote the following: 'I am in negotiation with the San Francisco, the Denver, and the Wellesley College Microscopical Societies as to my giving before them demonstrations in practical microscopy. It is quite possible that I shall leave here for the United States towards the end of March, or early in April. . . I feel certain that the demonstrations will be both interesting and instructive, and the exhibit of slides, etc., with the lantern microscope, will give pleasure to all who witness it.' The demonstrations include animal and plant section cutting, single and double staining, anatomical injection, selecting and arranging foraminifera, mounting in balsam and other media, construction and use of the lantern microscope. Any societies which are prepared to secure one or more of the demonstrations will unquestionably derive very great benefit, and we shall be glad to correspond with them relative to the matter”. The May issue of The Microscope included the following letter to the editor, “In the January number of the Microscope appeared an editorial upon the condition of our microscopical societies in general. I am very forcibly impressed with the truthfulness of your charges, especially when you say: ‘That the majority of the members of local societies are those who, without any special training, have accidentally or otherwise become interested in microscopy, bought a microscope, and have joined a society to learn how to use it’. I am going to take the liberty to make the above a pretext for drawing the attention of your readers to a fact which has a more or less bearing upon the subject. I am inclined to believe that this apathy, into which so many members fall, is very largely due to a want of knowledge of how to prepare even simple objects for examination. It is a fact to be deplored, that so few men can be found who are able and willing to give instructions in microscopical technology. I am sure that every microscopical society in the U. S. has a number of members who would gladly take advantage of such an opportunity, were it offered. Now, I am informed that such an opportunity has recently been presented to the different societies of this country, by Mr. Arthur J. Doherty, of Manchester, Eng. One would suppose that Mr. Doherty's work and skill is so well known that special advertisement is unnecessary, and that he would find no difficulty in making engagements in a country where just such information as he offers is so much sought after. However paradoxical it may seem, Mr. Doherty writes me, that he has received invitations, so far, from only three societies. He states further that he will be obliged to give up the project of coming to the U.S. to give instruction in section-cutting, staining, preparing and mounting objects for microscopic study, unless a greater number of societies can be induced to accept his offer. The Denver Microscopical Society is one of the three societies which has decided to take this course of instruction. I merely mention this, however, for the purpose of illustrating its effect. As soon as it became known among the members of this society that such an opportunity would be presented, new life seemed suddenly to pervade the whole society. Members who had not attended the meetings for months, eagerly subscribed themselves as members to this course, and expressed great pleasure that such an opportunity was expected. The truth is, they had lost interest in microscopical study, just because they did not know how to prepare the objects properly. I suppose that I may assume our members to be representative of the average membership of most of the societies of this country. In all of them there are a few who do most of the work, and many who have joined out of curiosity, and a desire to learn and see what the workers do. The latter are the ones whom a course of instruction, such as is offered by Mr. Doherty, would change into enthusiastic and useful workers. Is it not possible to stir up enough interest in this matter that more societies may decide to accept Mr. Doherty's offer and thus insure his coming to this country? For the information of those who may not know Mr. Doherty's terms I may add, that he charges ten dollars for a lesson given to a class. If the class consists of ten members, it will cost each member one dollar a lesson. That is the way we understand it. I did not find any records of Arthur Doherty actually going to North America. By June, 1888, he was again advertising from Manchester, now at 63 Burlington Street, “What offers in unmounted micro-material for first-class slides of the following: arranged foraminifera (50 varieties); sections of species of echinoderms (20 varieties); sections of bone and teeth (in Canada balsam), showing the lacunae and canaliculi; whole insects mounted without pressure; and choice stained and injected preparations?—A.J. Doherty, 63 Burlington Street, Manchester”. Figure 10. Advertisement from ‘The American Monthly Microscopical Journal’, 1889. Doherty also sought stones and fossils by 1889. In The American Monthly Microscopical Journal, he requested, “Specimens of rocks for slicing and grinding into sections; also bones and teeth of different animals, diatoms in situ on alga;, diatomaceous and polycistinous earths, ocean soundings, etc., etc. Liberal exchange in microscopic slides or cash. Arthur J. Doherty, 63 Burlington St., Manchester, Eng”. The Microscope offered “For a choice assortment of microscopic slides, send, in exchange, a parcel of minerals and rocks, or of bones and teeth of extinct animals, or of diatomaceous and polycistinous earths, or of diatoms in situ on marine algae. Exchangers will be liberally dealt with. A.J. Doherty. 63 Burlington St., Manchester, Eng”. Hardwicke’s Science-Gossip requested, “ Wanted, teeth and bones of different animals; also any rock specimens. Liberal exchange offered in first-class microscopic slides.— A.J. Doherty, 63 Burlington Street, Manchester”. The May issue of Hardwicke’s Science-Gossip raved, “We have received from Mr. A.J. Doherty, of Manchester, the following excellent slides: - Skin of ear of rabbit (injected carmine); tongue of kitten, trans, sec. (injected carmine), a beautiful preparation; lip of cat, vert. sec. (injected carmine and stained blue); medulla oblongata of rabbit (stained ruematoxylin), showing the fine nervous structure very beautifully; ankle of kitten, trans, sec. (injected carmine and stained blue), showing the ossifying cartilage, besides other interesting details; stomach of frog, trans. sec., pyloric end (stained carmine), showing the glands and columnar epithelium; apothecium of a lichen (Soloriua saccata), vert. sec., showing the spores in asci; anther of Lilium auratum, trans. sec. (stained carmine), showing all the pollen in situ; fertile head of field horsetail (Equisetum arvense), trans. sec., showing the spores with their spiral elaters; ovary of foxglove (Digitalis), trans. sec. (stained carmine), showing all the ovules in situ; trans. sec. of the spine of Aeroeladia mamillata, and echinoderm from the Indian Ocean; frog's blood (stained picro-carmine). The peri-nuclear portion of each corpuscle is coloured yellow, the nucleus itself red. With a good 1/4-inch objective the ‘intra-nuclear plexus of fibrils’ (Stirling) can be seen distinctly”. 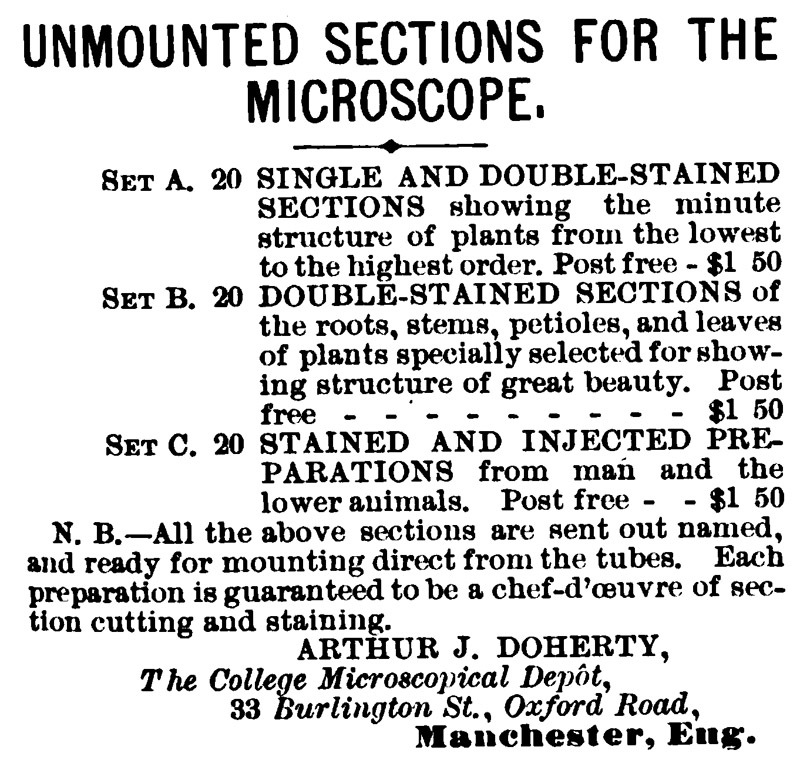 Beginning in 1889, Arthur Doherty began publishing advertisements that he was ending his microscopy business (Figure 11). At the same time, he requested items suggesting that he planned a chemistry-oriented business, “Wanted, a first-class chemical balance with working parts of agate, and susceptible to 1/4 milligramme. Also combustion furnace, potash bulbs, and any other apparatus for organic and volumetric analysts.— A. J. Doherty, 63 Burlington Street, Manchester”. Figure 11. “In consequence of my intended retirement from microscopical work” advertisement from A.J. Doherty, 1890. Despite such ads, the 1891 census still reported Arthur John Doherty as being a “preparer of microscopic slides”, at 63 Burlington Road. 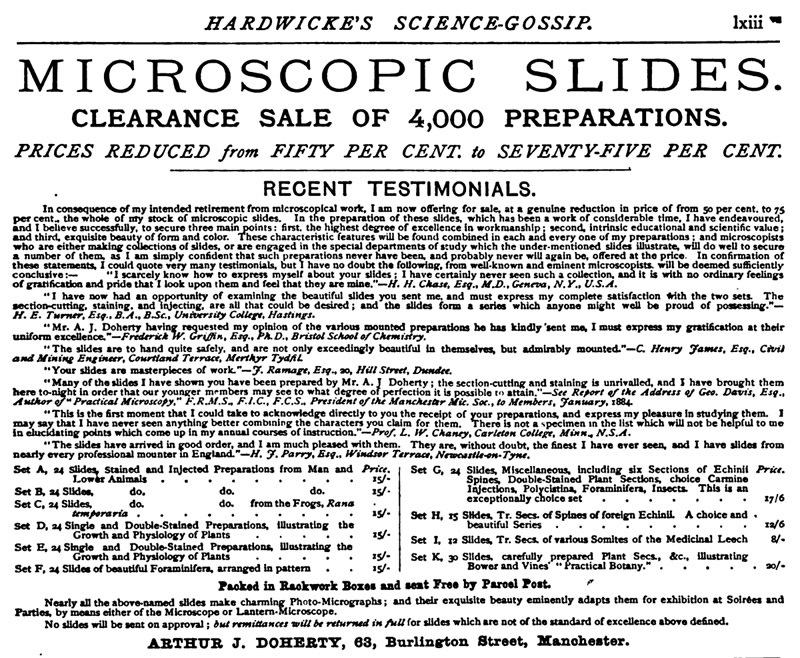 That same year, he published a large advertisement in Hardwicke’s Science-Gossip, indicating a “clearance”, albeit not a going-out-of-business sale (Figure 12). Figure 12. Advertisement from ‘Hardwicke’s Science-Gossip, 1891. I have not located any further advertisements from Arthur Doherty. The 1895 Slater's Manchester and Salford Directory reported that both “Doherty Arthur John, microscopist” and “Doherty Joseph, tailor” operated from 63 Burlington Street. The 1901 census of England found Arthur J. Doherty living alone at 63 Burlington Street, working as a “publisher’s traveler”. That is, a travelling salesman for a book publisher. The 1903 Slater's Manchester, Salford & Suburban Directory reported Arthur John Doherty as being a “householder” at 63 Burlington. During early 1904, Arthur married Sarah Jane Knowles. He was then 43 years old. Not long after his marriage, on January 3, 1906, Arthur John Doherty died at the age of 45. The probate of his will states that he had lived at “100 Lloyd-street Greenheys, Manchester”, worked as a “commercial-traveller”, and left Sarah Jane “£77 18s 3d”. Figure 13. (below) “Double Staining”, by Arthur J. Doherty. From ‘The Northern Microscopist’, 1881. 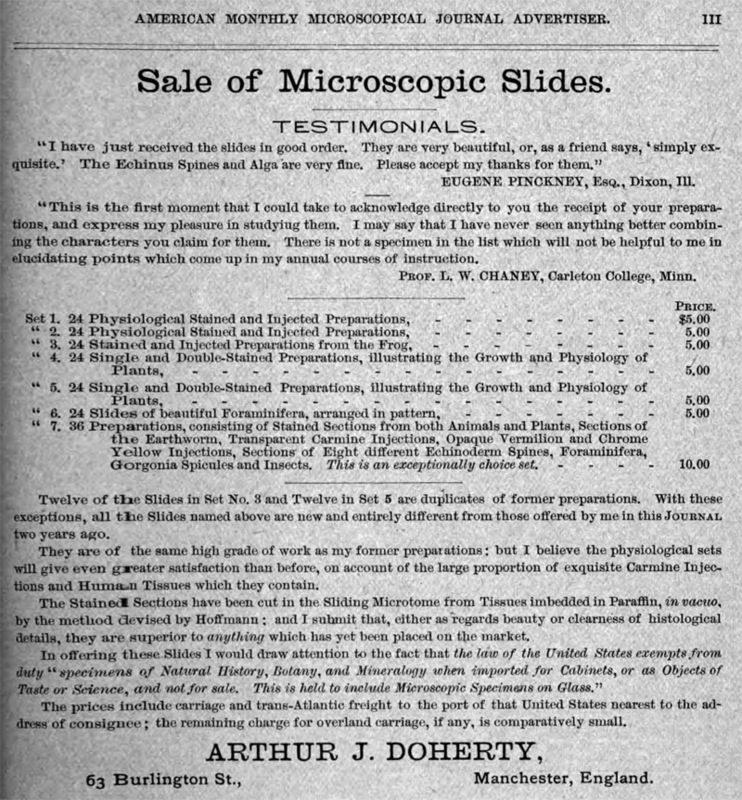 Microscopical News and Northern Microscopist (1884) Advertisement from Arthur J. Doherty, Vol. 4, inside cover, February issue. Stevenson, Brian, and Steve Gill (2013) The many lives of Heinrich Hensoldt (1856 – circa 1918), Moritz Hensoldt’s errant son, Quekett Journal of Microscopy, Vol. 42, pages 3-17.